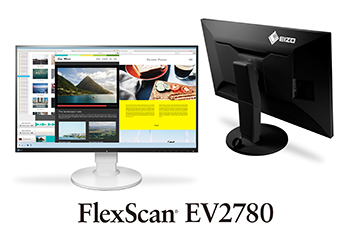 Hakusan, Japan, October 25, 2016 – EIZO Corporation (TSE: 6737) today announced the release of the 27-inch FlexScan EV2780, its first monitor with a USB Type-C terminal. With USB Type-C, a single cable transmits video, audio, and USB signals and supports a super speed transfer rate of up to 5 Gbps between the FlexScan EV2780 and connected devices. In addition, the FlexScan EV2780 can supply up to 30 watts of power for recharging notebook PCs and other devices via one USB Type-C cable, eliminating the need for separate power cables. The flexibility of a USB Type-C terminal makes the FlexScan EV2780 versatile for both conventional offices as well as the increasing number of “free address” offices where employees move around – usually with their notebook PCs – to collaborate with other employees as needed rather than work from an assigned space. The cabinet is essentially bezel-less with a frame that is just 1 mm in width. This minimalist design combined with a fully-flat surface makes for seamless viewing. The cabinet is available in black or white with cable colors to match. A built-in sensor called Auto EcoView automatically adjusts the screen’s brightness in accordance with the ambient brightness to trim power usage while reducing eye fatigue. A preset mode called “Paper” mode reduces blue light for more comfortable viewing.